↯ As the successor to the very successful TM-D700 the new TM-D710E offers true dual band operation with separate receivers for 2m and 70cm. 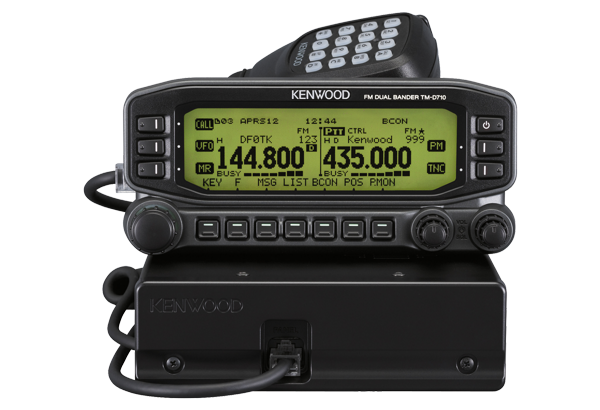 The receiver works from 118 to 524 and from 800 to 1300MHz. The max. transmit power is 50 W on each band, reducable to 10 or 5W. ↱ Like the TM-V71E the new TM-D710E supports Echolink operation. With an optional cable (PG-5H) and suitable software on a computer the transceiver can be immediately used as an Echolink node. Ten memories serve as special DTMF stores for often recalled Echolink connections. Other features: CTCSS/PL and DCS. Built-in TNC 1K2/9K6, APRS. Sky Command II and Echolink functions. GPS port, RS-232C port. 2-color display. Twin RX with V+V / V+U / U+U reception.